BWF MetaEdit is a free, open source application that supports embedding, validating, and exporting of metadata in Broadcast WAVE Format (BWF) files. BWF MetaEdit was developed by the Federal Agencies Digital Guidelines Initiative to support its guideline on embedded metadata in Broadcast WAVE files. BWF MetaEdit was developed with support from the Library of Congress and FADGI and in collaboration with Jerome Martinez of MediaArea. Choose from command line and GUI for Windows/PC, Macintosh OS, Linux. BWF MetaEdit allowed us to easily implement a process for proper management of our digital assets so the gain is primarily enabling preservation management and enhanced intellectual control of digital assets. The embedding process is, at minimum, 10 times easier using BWF Metaedit. Much of what we do with embedded metadata simply wouldn't be possible without this tool. Embedding and verifying checksums has become significantly easier, checking and correcting metadata prior to moving to Networked storage is also easier and faster. 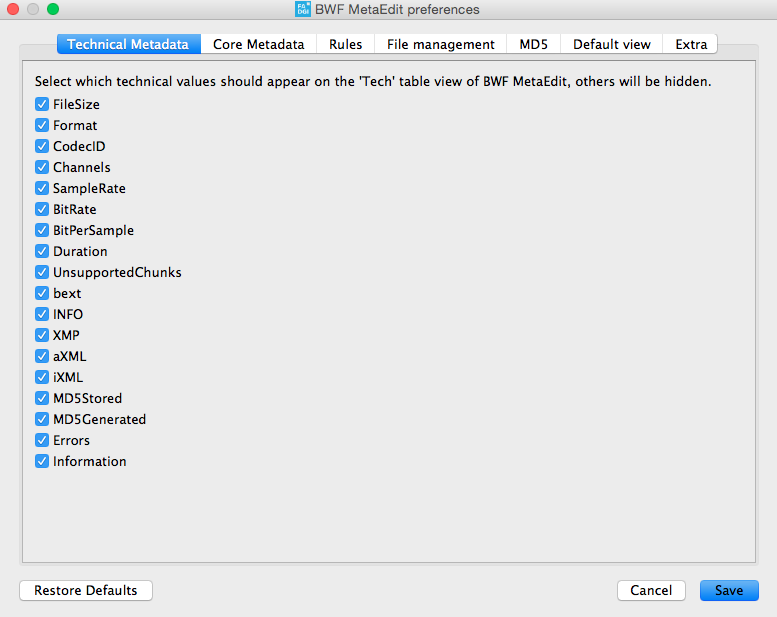 We can do huge amounts of automated metadata updates using BWF MetaEdit. I would wager that BWF MetaEdit has saves us thousands of hours at this point. We're exporting metadata from our MySQL database into a form easily imported by BWF MetaEdit, so that we can import descriptions and other fields into files. We're also using the export function of BWF MetaEdit to easily import technical metadata into our MySQL database. We've built much of our workflow off of BWF MetaEdit and rely on it heavily to accomplish large-scale digitization projects. It's very important to us!